It's hard to believe that summer vacation is almost over for me. It really did go by in the blink of an eye! I have about a week left of vacation and then it's back to school, so I'm trying to pack in as many things as possible so that I can enjoy every last moment of my fleeting freedom! I am also trying to have fun wearing all of my summery clothing before I have to transition to more professional attire. 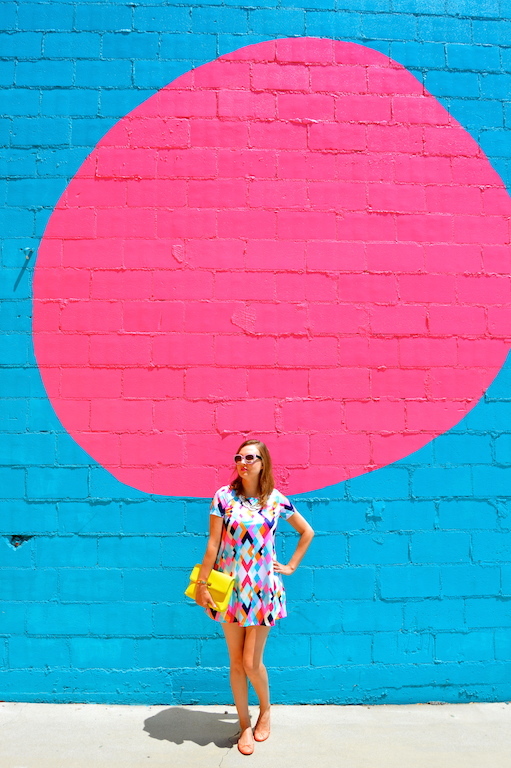 The other thing that will come to an end, much to my chagrin, is having time to seek out colorful walls like this amazing dot one, so enjoy the colorful backdrops in my posts while they last! 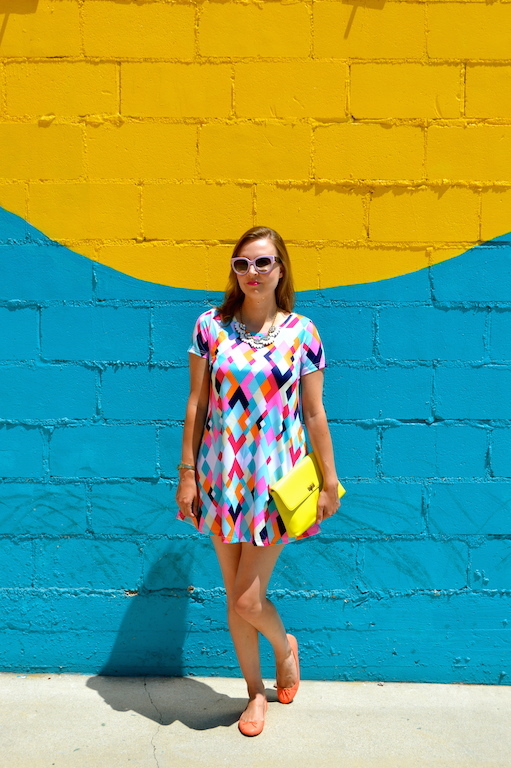 I picked out this dress from Make Me Chic a few weeks ago because I loved the relaxed fit and the colorful geometric shapes. 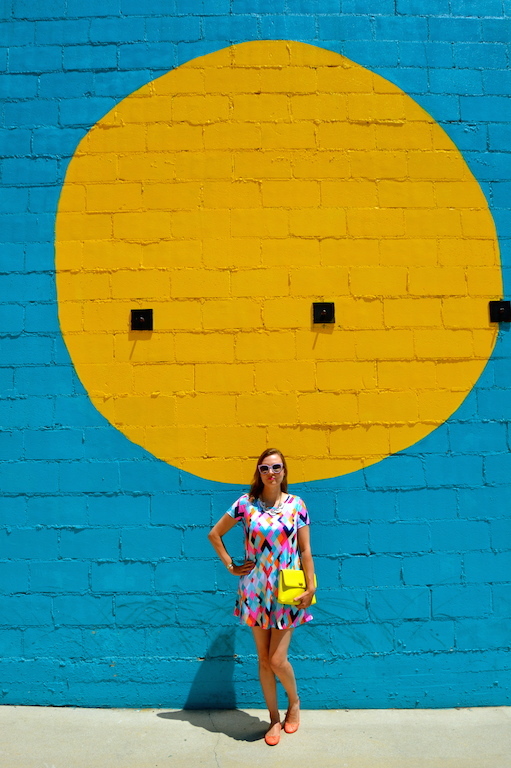 It's the perfect dress to wear for summer for the above reasons. If you are wondering about the fit, I will warn you that if you are on the tall side, like myself (I am 5'9"), the dress is a little short. (I am actually wearing shorts underneath so as to avoid unnecessary flashing!) However, with shorts/pants underneath or worn as a beach coverup, it's a lot of fun and if you are more petite, then the length would be perfect. 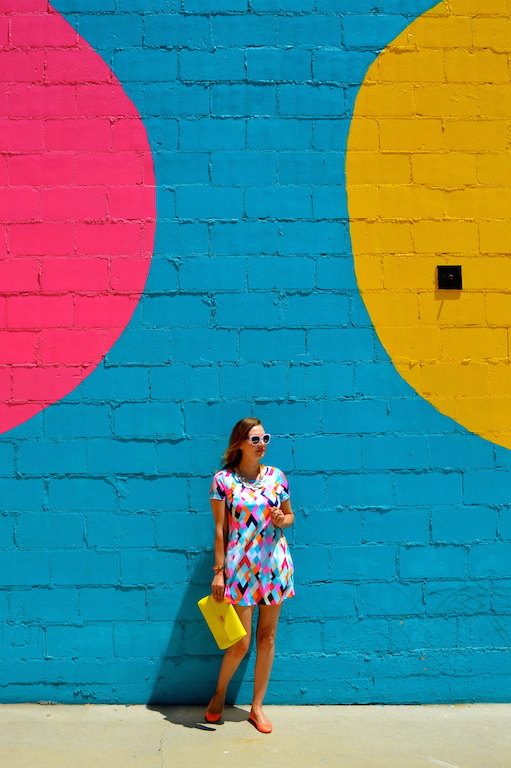 You always find the brightest walls to complement your colorful style. I love it! I love that colored wall behind. It goes perfect with your dress! Stopping by from Confident Twosday. Beautiful!! Your dress is so cute, and totally you! fantastic photos too! This wall is the best! Love how your dress is as bright as it. I'll be sad to say goodbye to all your fun wall finds, but I understand completely (and need to do some wall-seeking myself!). 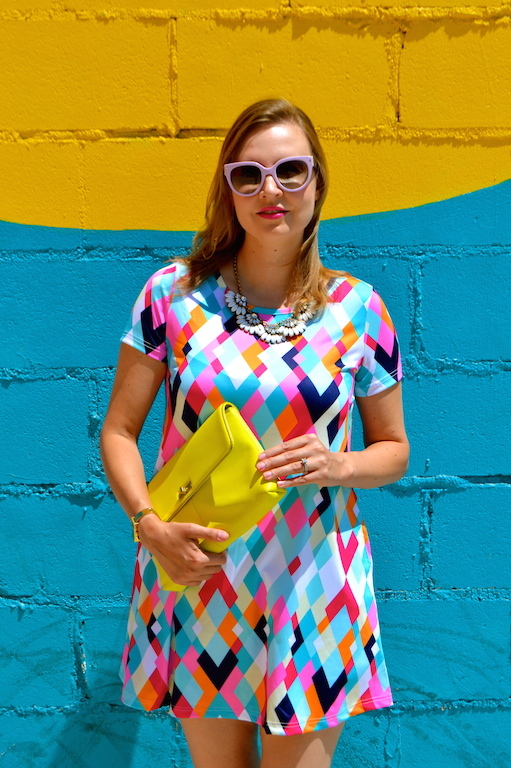 Love this dress and how your colorful accessories coordinate perfectly! That is such a fun dress. I love the colors and it really goes with the wall. 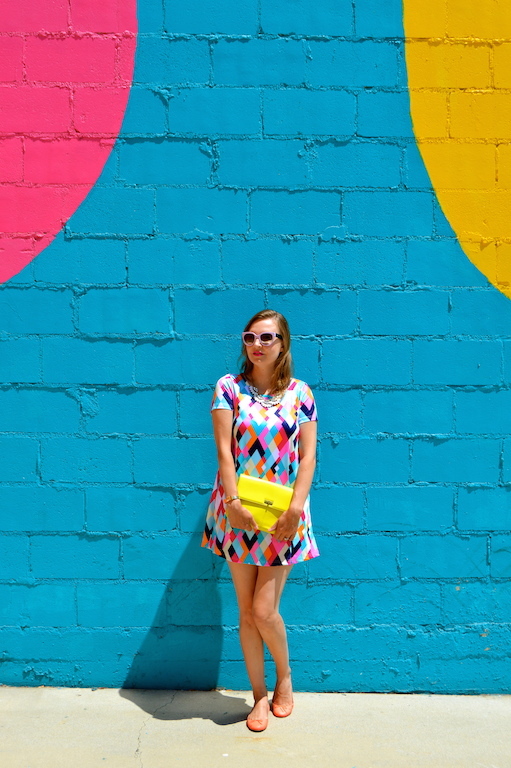 I don't know how you do it but the colours of the wall totally match the colours in your dress! And what colours that dress has and I love the striking pattern of it. 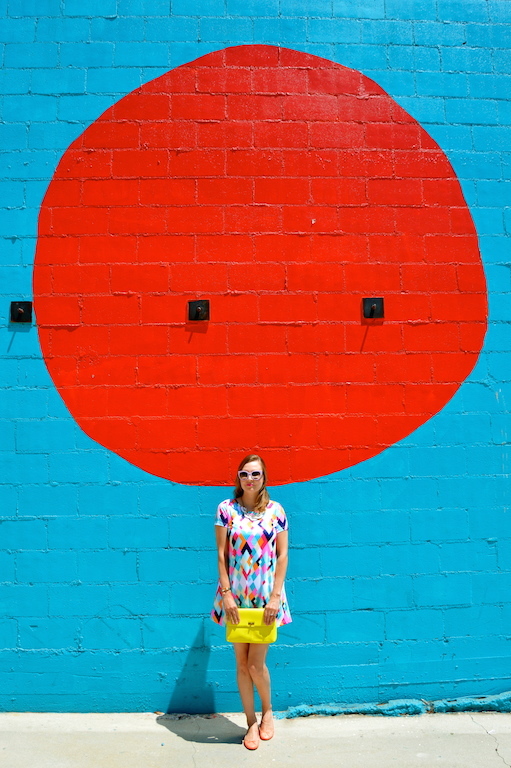 I do love these colorful posts and backdrops, so sad to see the painted walls go. Goodluck with going back to school here in the next few days.